"The Young General 少年将军 (shào nián jiāng jūn)"
The hunk in Romance of the Three Kingdoms, Zhao Yun is portrayed like the Antonio Banderas of ancient China, complete with sword wielding abilities equal to Zorro (or probably better?). Always the general of Shu Han 蜀汉 that appears to save the day when their need is crucial, Zhao Yun is arguably one of the most well-liked characters in the entire story. If you expect this character to have abilities to be feared in the card game, then you are right. 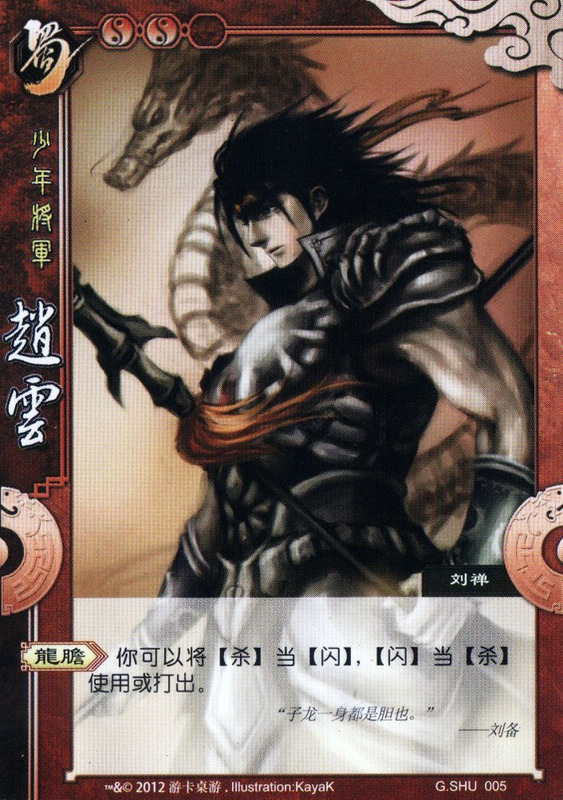 Character ability: "Dragon Heart 龙胆 (lóng dǎn)"
You can use or play your ATTACK 杀 as DODGE 闪, and vice versa. Scant relation to the story, really. We all know Zhao Yun is a really good fighter, so I guess it was natural to make his ability skewed towards attack. But the cool thing about Zhao Yun's "Dragon Heart" ability is he has a much stronger evasive ability than most players. Compared to Guan Yu 关羽 and Zhang Fei 张飞 who can heap loads of attack damage, Zhao Yun has an abnormal amount of ATTACK cards at his disposal but also has an incredible amount of DODGE as well! You kind of get the impression that the game makers want us to think that Guan Yu and Zhang Fei are pure brute strength while Zhao Yun has more dexterity and flexibility. “龙胆” could be divided into two Chinese characters, “龙” and “胆”. “龙” means dragon and it is a wordplay on Zhao Yun’s style name, 子龙. “胆” means gall bladder, and it was considered as the organ that stores courage by ancient Chinese, equivalent to “heart” and “guts” in English words. After fighting at the Battle of Hanzhong, Liu Bei praised Zhao Yun that “子龙一身都是胆也！(Zilong is full of corage)”. The ability mechanism refers to his skill of fighting, killing lots of enemies while protecting himself unscathed. BTW, the weapon of Zhao Yun in the video game Dynasty Warriors series is also called 龙胆, and I suspected that the game maker just copied the name of this weapon.